When it comes to making compost, a few basic tips can make all the difference. A compost pile can pay huge dividends for the home gardener. It helps to build and recharge soil in vegetable gardens. And it adds power to potting soil in containers and hanging baskets too. In general, it helps nearly and and every living plant grow better. Compost is the key to creating healthy, nutrient-filled soil. Perhaps, best of all, it is 100 percent organic! And by following a few simple steps, it’s easy to make in no time at all! Compost, put simply, is the ultra rich remnants left behind when organic materials decompose. Known as “black gold” by gardeners, compost is teeming with minerals and nutrients. And those nutrients provide lasting power to the soil that feeds living plants. All organic materials eventually decompose. Left to sit for years, a pile of whole leaves or grass clippings will eventually decompose. A pile of leaves will eventually break down on their own. But in a compost pile, shredded leaves can turn into black gold quickly. But a compost pile can speed the process up. And in the process, turn your kitchen and yard waste into “black gold” fast! 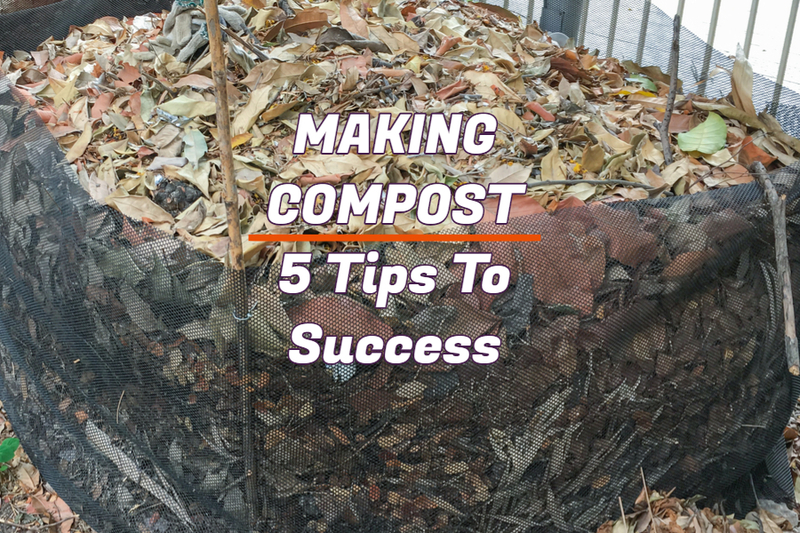 Here is a look at four simple steps to create perfect compost. Compost piles work best when they are made up of the right mixture of materials. This allows them to break down quickly. There are two basic types of materials that go in a pile – browns (inactive) and greens (active). The browns are carbon based. They are composed of materials like leaves, twigs, wood chips, ashes, dry grass and clippings. Fresh grass clippings are a great source of nitrogen to a compost pile. Greens on the other hand are nitrogen based. These are materials that will heat up the pile to decompose the browns. The greens include chicken, rabbit, horse or cow manure, fresh vegetable scraps, green lawn clippings and even coffee grounds. So what is the right mix? As a good rule of thumb, a compost pile breaks down the quickest when there is a ratio close to 2 parts of brown material (carbon), to 1 part green (nitrogen). Do you have to be exact? No. But if you stay close to the ratio, the pile heats up and breaks down faster. Potato peels will decompose quickly in a compost pile. As an example, if you put two shovel-fulls of leaves in your pile, you need to add a shovel of manure, coffee grounds or fresh green lawn clippings. This keeps the pile in balance. When starting a new pile, begin with a bit of compost from your last pile. The organisms and bacteria present will help put your new pile into “decomposition mode” faster. Creating the right-sized pile is also important. If a pile is too small, it will not generate enough internal heat for decomposition. A pile at or around 3′ high x 3′ wide works best. It is large enough to create heat. And also small enough to manage for the gardener when turning. Chopping ingredients prior to putting in the pile is a huge secret to making compost fast! As you build or add to your pile, break up or shred all materials. Spent coffee grounds are great for a compost pile. Use a lawnmower to shred leaves, grass or straw. Cut kitchen scraps with a few extra chops of the knife. Always remember, the smaller the ingredients going in, the faster they decompose. Like humans, a compost pile needs oxygen to breathe, live and work. When a pile has adequate oxygen, it decompose quickly. Turning the pile every few days keeps oxygen present though the entire compost pile. At minimum, turn once a week. Keep your pile turned regularly to keep oxygen in the core. Turning a pile every few days can drastically reduce the time it takes to create finished compost. And by shredding first, it makes turning the pile an easy chore. Last but not least – keep your pile moist. Again, like humans, a compost pile needs water to stay alive. When there is a lack of moisture available, decomposition slows or stops. As you turn the pile, if it seems dry, add a few gallons of water. You can also cover with a tarp to help retain moisture on hot days. Compost is the key to healthy plants. But we aware that too much moisture is detrimental as well. It can smother and keep a pile from heating up. A good pile should have the consistency of a well-wrung sponge. Damp, but not dripping. Once again, a tarp can help keep a pile dry enough during heavy or prolonged rains. So get that compost pile going this year and start making Black Gold. Your plants will thank you! This Is My Garden is a garden website created by gardeners, for gardeners. We publish two articles every week, 52 weeks a year. Sign up today to follow via email, or follow along on Facebook. January 12, 2019 TIMG Comments Off on 6 Great Cucumber Varieties To Grow For Fresh Eating or Pickling!